BURN HALO have announced a sizeable batch of new tour dates today along with a new singer, ex-TRACKFIGHTER frontman TJ Chopelas, replacing former 18 VISIONS frontman James Heart. BURN HALO released Wolves Of War last year via eOne Music and was produced, engineered and mixed by Fred Archambault (AVENGED SEVENFOLD). Wolves Of War, the first BURN HALO album through the California band’s new deal with eOne Music, burns with a fire akin to the brutal-but-melodic juxtaposition of New Wave Of American Heavy Metal standard-bearers KILLSWITCH ENGAGE, the neo-GUNS N’ ROSES attack of AVENGED SEVENFOLD, and the dark ambience of HIM. 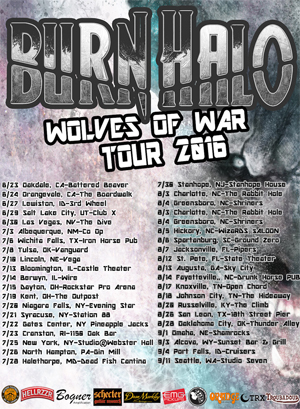 Fans who adored BURN HALO singles like “Save Me” and “Tear It Down” will be fall in love with BURN HALO all over again, even as longtime EIGHTEEN VISIONS acolytes will delight in their throwback power. BURN HALO has built a sizable and strongly devoted following, touring the world with Avenged Sevenfold, Papa Roach, Buckcherry, Escape The Fate, Static-X, Saliva, Puddle Of Mudd, Tantric, Adema and many more trailblazers and rock n’ roll hitmakers.